"A lot of times we receive models from other companies or sources that are very bad: excessive vertices, missing faces, flipped and non-unified normals, etc. Over all, they are just terrible models to work with. As a result, we rebuild them here so that they are native to 3ds max and can be optimized to suit the nature of the animation. For example with the NASCAR on Fox project, Digital Dimension and Fox attempted to obtain the models for the car bodies. We received IGES, STL and even a NURBS model of the Ford, but this NURBS model had so many problems to deal with. Working with GHOST 3D we were able to rapidly rebuild the car bodies, even the NURBS Ford body, using the ResErect and Surf-iT plugin tools for 3ds max. 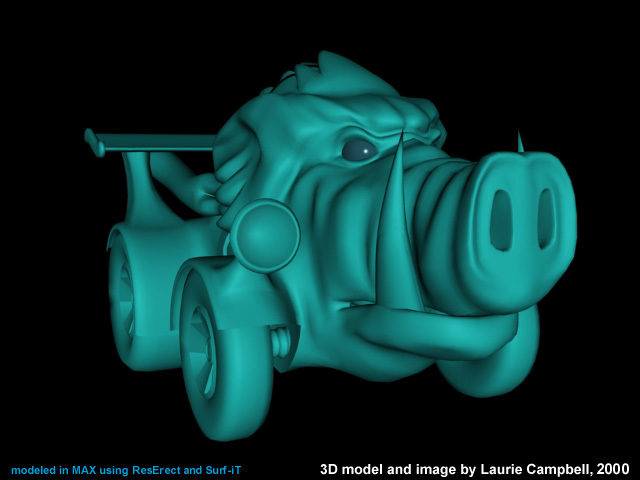 ResErect and the custom tools GHOST 3D developed around it presented us with many time saving solutions to avoid the problems we were encountering, and to help us produce quality 3D models for the animated sequences for Fox." Edmund Kozin, Digital Dimension, North Hollywood. Are ugly models ruining your animations?. . . ResErect ?em! ResErect? is a new and uniquely designed plugin for 3ds max? and 3D Studio VIZ�, providing 3D artists with a completely parametric reverse engineering system. Now you can incorporate any model and virtually any 3ds max modeling tool into the powerful process of Spline modeling - whilst preserving history and pre-existing sub-object animation! Spline output can be optimized automatically or manually by using interactive re-building operations to make the object more efficiently designed, more manageable to edit, and so that it uses less memory during model editing procedures. Manual controls incorporate a unique keyboard-driven re-building system: simply press the direction buttons or keyboard shortcuts to rapidly follow the desired path, making Splines flow around the model exactly as you want them. - Converts Patches, Splines, and Meshes to Splines (not segments). ResErect's Spline optimization is even faster now. - Processing speed has been enhanced for 32-bit and 64-bit processors. - Improved stability for larger objects and instancing. - The ResErect modifier is a one-of-a-kind single modifier that contains 3 independent modifier modules. You only need select the object and add the modifier. ResErect automatically determines what type of object it is: mesh, patch, or Splines, and then applies the appropriate ResErect module to convert to an optimized Spline object. - Finally, an importer for Hash's animation master objects. Imports object and texture mapping into patches. Then ResErect can instantly convert to Splines when desired. - These controls are totally unique. Use command panel or customizable keyboard shortcuts to rapidly select and rebuild edges/segments into the most meaningful configuration of Splines - without having to navigate the viewports. It's much much faster than other selection means, and what you see is what you get. - Genrerates optimized Spline sets in the straightest path possible automatically. It's even faster, and adjustable. If you only like some of the results, you can "lock" down Splines and segments that you like and rebuild using different settings. - The ResErectMesh module provides vertex assigments at the Spline level to instantly create curve interpolation for low resolution mesh models that you are converting to Splines. For example, a 6-sided damper object can have all of its parts converted to a perfect cylindrical shape using ResErect and just a few setting changes. No more sharp edges when you want them curved. - Okay, so you are an expert Spline modeler, but your Spline models have too many Splines and segments to manage. ResErect the Splines in to optimized Spline objects and preserve all of your vertex types where possible. ResErectSpline module lets you keep the vertex types, and then as you rebuild them ResErect will respect the original vertex types whenever possible. When it is not possible, ResErect maintains the shape and form of the Splines as a priority. - The ResErectPatch module converts patch objects to Splines and optimizes them for reconstruction, reverse engineering, animation, etc. - All the ResErect modules accurately match source topology so that you can re-surface the Splines with Surf-iT or NURBS and produce the original look of the original object with an optimized surface or a better looking high resolution surface! - With ResErect, reverse engineering and modifying objects has never been more easy. Use ResErect with Surf-iT for the most powerful reverse engineerng and modeling in 3ds max and VIZ. ResErect allows 3D designers and animators to work with existing models as a framework. Import an object or use any 3ds max, 3ds max Design or Autodesk VIZ modeling techniques and tools to create Spline, mesh, or patch based objects. Then use ResErect to convert and rebuild them automatically or manually as optimized Spline objects. Spline output can be optimized by using interactive rebuilding operations to make the object more efficiently designed, more manageable to edit, and so that it uses less memory during model editing procedures and animation. Secure online ordering and download.